Amazing in size and function, the seed is capable of fantastic feats. Given water and a little room to grow, some good soil and sun, a little unsuspecting nugget can transform into a surprisingly beautiful, unique organism. An organism that exhibits its own evolved characteristics for survival – as in thistle, poison ivy, stinging nettle all of which we might try to avoid. Or, to our epicurean delight – watermelon, tomatoes, peppers, eggplant broccoli, basil, beets, alpine strawberries, lettuce, kale, chard and too many other tasty edible plants to mention. To read the seed catalogs, dream of the garden, purchase the seed, hold the packets, is all about pure creative intention and maybe some planning. A beautiful place for the mind and body to dwell, in the sway of imaginative bounty and abundance if, like me, you are OCD about seeds. But the needle skids the record when the shovel hits the dirt. If you’ve been gardening for a while and have planted seeds, you’ll know… this is where you let go – in that moment you have the opportunity to concentrate on the transition between what you dream of and what you have. How wide is that void? So there it is, dirt and the newly planted seed, you can’t see it anymore but it’s in there and it is supposed to become something. My daughter loves strawberries. Most strawberries are not planted as seed but are cultivated by cutting off smaller plants along rooting stems or by root divisions. 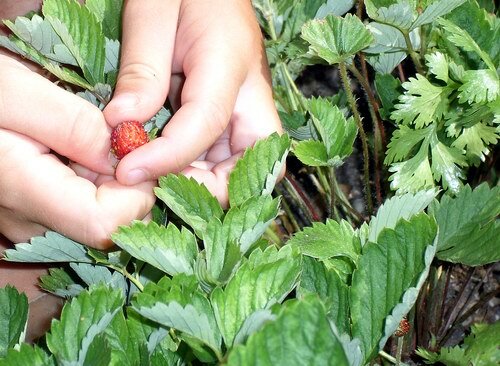 Alpine strawberries, the tiny little fruits that burst with flavor and can be found in woodland areas in the Northern Hemisphere, may be grown from seed. The seeds are microscopic (in my opinion). When planting, there is no way they can be singled out. One must simply scatter hundreds of seeds in a flat and observe what shoots up. The seed must be kept in the dark until the seedlings sprout (according to the directions on the seed package). My daughter who is ten, made the strawberry project her own. She propelled herself into this, dreaming not of lush berry plants with nodding flowers composed of delicate white petals and smiling yellow centers but of things further down the road. Strawberries and vanilla ice cream, strawberry shortcake, strawberry pie and even strawberries right off the plant… without the cream and sugar. The seedlings came up surprisingly fast, if these were the right seedlings, I wasn’t sure, this was my first time growing these seeds. I peered at them and wondered if the bed had been “contaminated” with other seeds, weed seeds? They were tiny, and didn’t do anything. They sat there in the flat, petite and undemanding. Not looking for transplant, not really caring about much except being a stem with a teeny tiny leaf or two. After a month of seedling “Wu Wei”, we decided to put them in the raised bed outside. Carefully picked apart and inserted into pencil size holes they were swallowed up by the soil. Still, they sat idle as another month went by. This was late April and every time we got a downpour I wondered if this was the rainstorm that would wash them away. While nothing was happening on the surface, much must have been taking place underground. The roots were winding their way about the soil seeking moisture and nutrients. Once the weather got consistently warmer additional tiny leaves appeared. My daughter’s faith in these baby berry plants never wavered. She talked to, and tended her little plants several times a week, weeding and watering with true focus and commitment. By May, the plants were sending up sprigs that would fan out into cute saw-toothed leaves. Yet the Alpine Strawberry plants were dwarfed by their regular sized cousins (also in the same raised bed) so they still looked ineffective and weak. And then we got a little flower! My daughter watched the flower morph into a tiny yellow/green berry that eventually started to blush pink. With patience she waited until the next day to pick the berry, knowing that flavor comes with peak ripeness. That next evening, she headed out to the raised beds to pick her first strawberry of the season. Unfortunately, something else had gotten there first. The tiny fruit was gone, chewed off of the stem, red bits still attached to its green base, leaving little doubt about what had happened. My daughter has been by my side gardening with me since she was a toddler. She knows the ups and downs of planting a crop. She knows there will be more berries. She still has plenty of faith in her little strawberry plants. She stands undeterred, vanilla ice cream at the ready.